This is the second installment of a blogpost on Ineke Veldhuis-Meesters study visit to Calcutta, India, which took place from 6 – 13 November 2016. It is the seventh article in a series of reports and blogposts related to the project “Dealing with the Past in History Education”. The preceding blogpost of Ineke’s visit can be found here. Located in the eastern part of India, Calcutta is the capital and administrative center of the state of West Bengal. The former capital of British India, Calcutta is a veritable melting pot of cultures. The diverse nature of the city is reflected in the education system. As with every state in India, there are schools in the city that are affiliated to the State Board and offer a syllabus designed for the state, by the state. The other boards of education are the Central Board of Secondary Education (CBSE) and the Indian Certificate of Secondary Education (ICSE). These three main boards of education differ from one another in terms of content, modes of examination and assessment. The city of Calcutta also has around 300 state-recognized madrassas, or Islamic religious schools. To add to this already fascinating mix, the language of instruction differs too. In some, it is Bengali, which is the predominant language spoken in West Bengal, in some it is English and in some it is Urdu or Hindi. There is also a large non-formal school system that runs in tandem with the formal private and public schools. Akshar (‘Alphabet’ in Sanskrit) is the first inclusive school in Calcutta. It was started in 1998 by the Rajpal Khullar Trust to fulfill the need to establish an institute that benefits children with borderline special needs. As a rule, the school admits five special needs students on an average per class, who are seated between the other children. While there are teachers trained in special education to give individualized care to the students who need it, each class also has teachers who assist students with special needs, helping them out with whatever they require during a regular class. The school offers the Indian Certificate for Secondary Education (ICSE) board for the mainstream classes, and the Open Basic Education (OBE) and the National Institute of Open Schooling (NIOS) curricula for those with special needs. The academic level is the O-level (like in the British system). The government recognizes the School Leaving Certificates. There are 17.000 of these schools in India, as per the information from the principal Mrs Noni Khular. Before I witnessed classes with Grade eight and Grade seven, I was shown around the school and introduced to educators—both special educators as well as those teaching the regular classes. What struck me immediately in Akshar was the happy atmosphere, the happy children, the encouraging inclusiveness – really Impressive. 20% of the pupils have disabilities such as Down syndrome, physical and mental handicaps, ADHD, dyslexia, autism or Asperger. Ms. Noni Khullar, the principal and Co-Founder of the Akshar School explained her philosophy. The mainstream children will learn from the lesser-abled – how they strive to achieve their goals despite limitations (See picture of the school’s magazine ‘Mentor’ with principal). They will grow up to be sensitive and compassionate children with sound humane values, who have known students with challenges and are friends with them. Students with disabilities are also challenged by the teachers to prepare them to deal with the real world outside the school environment and are taught how to deal with success and failure. I was enthusiastic about what I saw and heard: how they practice what they talk about and how they achieve to be such a happy school community. I admire the strong principal and her able staff – an experience I took home. I attended history class with Grade eight, 13 year olds and Grade seven, 12 year olds. In both classes in an instructional conversation history was taught as events and facts to know and understand; the teacher explains and asks questions and always relate the historical content to India today. So Historical Significance came in: “What is nationalism today, what about the individuality of a nation in the present context?” – Questions to think about. It was in an agreeable and relaxed learning atmosphere. Most said that they like history because they can learn about the past, want to know how life was in the past, and also because their teacher is entertaining. And they could learn about the history of other countries, e.g. in Europe. Calcutta International School (CIS) is the first school in the city to offer the GCSE syllabus recognized by Indian Boards. The Cambridge International AS and A levels are offered here as well. The CIS caters to a large cross section of students from Calcutta as well as children of expatriates. Founded in 1953 for the British expatriates, the school has 17 nationalities of students. I was shown around the school by Ms Tina Servaia, history teacher in the middle and senior school and also member of the Advisory Board of History for Peace. The School has good resources. I did not visit classes but in a separate room I had ample time to engage with students and later teachers. At the end of the visit I had a conversation with the Principal Dr. Nath about the level of students, teachers and the education in her school and about training opportunities for her teachers. Eight students from the AS, A2 and IB classes, , 16 to 18 year olds, who have taken up humanities and history, sat around a table for nearly half an hour with me. They shared their experiences of studying in a school that has a different curriculum and a different teaching methodology than most other schools in the rest of the country. They recognized that the curriculum itself offers a lot of freedom in terms of analysis and interpretation of texts. The students enjoy their history classes particularly because of the freedom given to them to discuss, analyze and debate. They are curious to know what happened in world affairs in historical, economic and sociological aspects. “There are events in the past related to the political, ideological and religious conflicts we want to know and understand: History is (connected to) current affairs”. The students are keen to find out what happened, in this way: “Give us a lot of sources and five perspectives, let us research to find out what happened, discuss what could have happened, and to see how other countries “have become different”. It was a lovely conversation with these 16 to 18 year olds on a quite high analytical level. “Humanities is less structured than science, so you can think more openly”. The students were enthusiastic to share why they liked the subject. There was such a free and enthusiastic atmosphere, amongst the eager and intelligent students, who “see the subject history as analysis”. The question about ‘difficult history’ seemed irrelevant to them. “Nothing is difficult, if you analyse,” they said in their youthful enthusiasm. The Modern High School for Girls was founded by Mrs B.M. Birla in 1952. Mrs. Birla came from a leading industrialist family and the school at that time set a revolutionary example in the area of women’s education. The school offers the Indian Certificate for Secondary Education curriculum to their students. Dr. Devi Kar, the Director (and former Principal), Ms. Damayanti Mukherjee, Principal and Ms. Amita Prasad, the Vice- Principal gave me a friendly welcome. Dr Kar spoke to me in detail about the ethos of the school. A school that combines the best from the East and the West, with a principal who stood outside the regional rivalry. The school calls itself an ‘All Faith school’. After 35 years of rule by an American missionary, Dr. Kar succeeded as the third Principal in the school’s history and the first of Indian origin. Dr. Kar and the vice-principal Ms. Amita Prasad challenged me in a talk about Sam Wineburg’s ‘historical thinking’ ideas. Dr. Kar was really engaged, and also attended the EUROCLIO presentation and the first part of the workshop the following day. 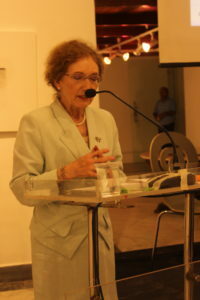 On the first day of the conference she led a panel discussion on how to translate theories on nationalism into the school practice. I was able to attend two history classes, for Grade 10 and Grade 12. For Grade 10 Ms. Sunita Biswas taught a class on Gandhi. Ms Biswas used a video clip of Gandhi being interviewed by a US journalist as well as an audio clip of a narration of a poem by Tagore. The class was captivated by the images and by the reciting voice. Subsequently she handed out the text of the poem which she asked the students to read and reflect on. Both of these teaching tools fed effectively into a discussion on Nationalism vis-à-vis Patriotism. The students reflected on Sam Wineburg’s philosophy: they thought historically and explained that history was in some ways challenging, while being complex, multifaceted, one opinion never prevails. That was the product of the watchful guidance of good teachers, who stimulate and get their students engaged in research. The team of history teachers share the same aims but they teach in different styles. Dr Kar gives her teachers freedom because she trusts them, she said; which is indicative of an open learning atmosphere in the school. The teachers spoke about influence of the parties on the National Curriculum Board and how the Board influences the selection of topics. The most difficult aspect was seen as: how to handle the changes in perspectives. “History is all around us, it is the basis of all other disciplines”. ‘History Education- A mirror of pride and pain?‘- Workshop at Modern Academy of Continuing Education. Ineke began with a presentation on what history means to different people and how as history teachers it becomes important to take the different perceptions into account. 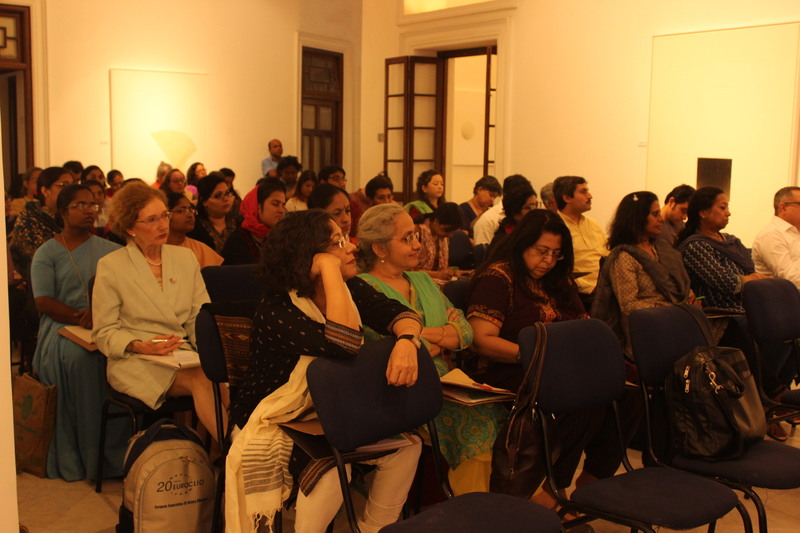 Some of the participants spoke about biased perceptions of history in the subcontinent. What was interesting was that both students (senior students from Modern High School) and teachers had very similar points to make regarding bias and how textbooks reflect the inherent bias of the author of the textbook and the politics of the nation at the time of writing the book. Participants were grouped into 5 groups of 4-5 each for the activity, which was an exercise on how different perceptions can be, even among teachers. The teachers were asked to, first individually think of events that shaped the country. The process was then repeated, in pairs and then a larger group. The participants had to work as a group to reach a consensus, as the number of events allowed per group was limited. Interestingly, the activity started off with many participants agreeing with each other, but as the groups became larger it apparently became harder to agree! At the end of the allotted time, the participants presented their work, having recorded points on charts. Some of the common events chosen included partition and the Swadeshi movement. One of the groups mentioned ‘the emergence of a national identity’ in relation to the struggle for Independence. May I add as author of the report, that is was a joy to me to work with such motivated teachers and trainees, who were open-minded, asked without reluctance, debated and thought deeply while constructing different kind of basic curriculum frames. One of the groups did not jot down events, but concepts: “as events develop out of concepts.” The participants were given a hand out at the end of the workshop to enhance the effectiveness of the workshop as a basis for continuing the discussion together. This blogpost concludes the report of Ineke Veldhuis-Meesters study visit to Calcutta. This study visit has been a part of the project “Dealing with the Past in History Education”, supported by the Robert Bosch Stiftung. For more information on this project, please visit the project page.